Broad City Review: "Hashtag FOMO"
Before I say anything else, let me say this: “FOMO,” that is, “the Fear Of Missing Out” is a very real, very familiar phenomenon. It’s also the name of this week’s extremely funny episode of Broad City. Additionally, “FOMO” is one of the most irritating acronyms I’ve ever heard. Thankfully, as a wizened late-20-something who’s more likely to spend his evenings, say, reviewing a TV show than chugging Four Loko*, I probably won’t have to listen to people say “FOMO” in person, but my deepest sympathies go out to everyone who will after this week’s episode. Of course, the episode’s most surprising (and hilarious) moment came with the introduction of “Val,” Abbi’s chemically-altered alter ego. I haven’t been very found of Broad City’s more surreal turns in the past, but this sequence did a great job of balancing a goofy joke with a relatable experience, all while giving Abbi Jacobson a chance to exercise some her less utilized talents. 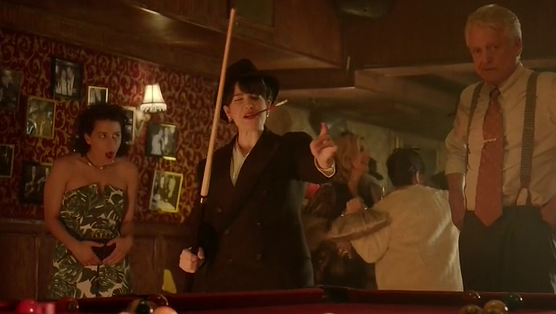 The bartender’s facetious claim that Val had been visiting the club “for over a hundred years” is a perfect example of how this was done right, letting us enjoy the weirdness of the scene without throwing the show’s reality out the window. Unfortunately, I don’t have any other notes on the episode because I spent most of it laughing. At first I thought “Hashtag FOMO” might match series highs “Destination Wedding” and “Knockoffs,” but remembering how many of last night’s gags slayed me it’s really no contest. Once again, Broad City has outdone itself. Once again, I can’t wait to see what next week brings. *I now chug terrible wine instead. †Thought Catalog, which will pretty much publish anything, barely has three pages on the subject.